The St Raphael’s Adult Bible Study Program uses the Catholic Scripture Study program. It is an in-depth study program usually lasting 26 to 28 weeks per year. We start in September and usually end before or after Easter. This program was founded by Gail Buckley and uses Catholic authors like Scott Hahn, Steve Ray, and Father Pacwa of EWTN. We have class registration each year in August after all the Masses and throughout the class year if you miss the sign up period. The same lesson is offered four times each week: Sunday at 10:15 a.m. in the School Library; Tuesday at 7:00 p.m. in the School Library; Thursday at 10:00 a.m. in the Rectory Room 5 & 6; and, Thursday at 7:00 p.m. in the School Library. 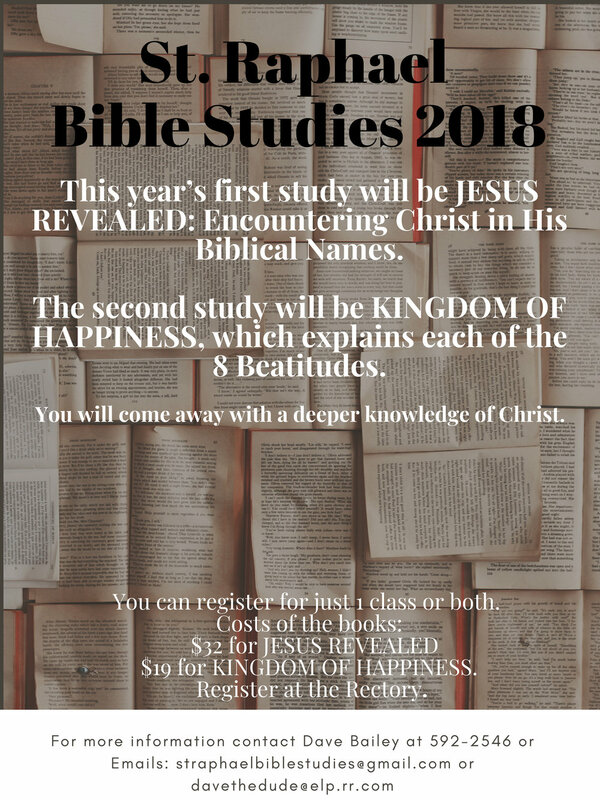 This year’s first study will be Jesus Revealed: Encountering Christ in His Biblical Names. Jesus Revealed is an engrossing exegesis of the entire Bible, focusing on the typologies of Jesus through 18 of his unique names. Fr. Jeffrey Kirby provides profound and practical spiritual insight to help apply what you’ve learned to your own spiritual life. The second study will be Kingdom of Happiness: Living the Beatitudes in Everyday Life. Featuring teaching videos by Fr. Jeffrey Kirby, and powerful profiles of normal people living out the Beatitudes in heroic ways, Kingdom of Happiness will not only inform participants about the Beatitudes, it will show them the way to living them and achieving true happiness.